The first music server and audio player software (June 2011) to directly play DSD format (dsf / dff, 64Fs and 128Fs) audio files with any DAC (real-time conversion to PCM during playback), plus full native DSD Audio Support (on DACs supporting DoP). "The sound is excellent, and the memory play with gapless files is doing well... Thanks for all your work on this... great product." "I love the product, it destroys the competition and I'm trying to figure out the best way to diplomatically express that opinion [on an audiophile forum] without igniting a flame war." "Historically I'm a pure vinyl user but I always wanted only the player part of this software without the overhead..." "It has an outstanding low end, the imaging is excellent." "Congrats on having a winner ... substantially improved the performance of my computer audio server setup compared to iTunes." "pure bliss" "I continure to be very very impressed with Pure Music and was further impressed with the telephone tech support. I don't recall who I spoke with, but he was terrific and the problem was quickly resolved. The ability to access my computer was great and not only was a more efficient way to figure out the problem, but I could also see & learn how the problem was fixed and preferences was navigated. Your service should be a model for tech support." "Never better sound... amazing clarity and soundstage." "I have just purchased your Pure Music player and was delighted with the quality of reproduction vs. iTunes. Tonight downloaded the update that allows you to upsample - wow - best digital replay I have ever heard from my system. Keep up the good work - what's next?" "I gave your Pure Music program a try and I have to say I'm impressed - playback sounded noticeably better using Pure Music than with iTunes alone, for files from 44.1 all the way to 192 kHz sample rates. Interestingly, setting my FireWire/S/PDIF converter to 24/192 and allowing Pure Music to up-sample files rather than having the DAC do the up-sampling also bumped the sonic performance up another notch." "Pure Music is by far superior to the famous player A... High range and dimensional image are nearly perfect." "Your software is a great achievement for computer-based music users. It sounds definitively very nicely, with a full and rich medium, detailed high and clean bass... the dimensional image is wonderful, wide, deep and opened. Globally, it's well balanced, very musical!" "I'm currently testing Pure Music 1.2 and my first listening conclusions could lead me to replace [a competing product] I currently use. [That product] is already a great improvement over iTunes, but I found that Pure Music is going quite a step further: more tri-dimensional image, much more definition, presence and "matire" (sorry, I don't know how to translate the exact word in audiophile language) on voices and instruments." "I hope you have a lot of success with this new player. It might be exactly what the 'pure digital' guys need (at least the ones who can rise above the snobbish attitude that it has to be expensive to be good)." "I have been using the Pure Music player for over a month and prefer it to [the much more expensive competing product]." "[Pure Music] 1.2 is great! Thank you for your continuous support, it's been outstanding." "Pure Music sounds splendid - you must be very pleased with it." "I love the product." "The sonics of Pure Music... are a revelation." "Today, I uploaded Pure Music 1.11 demo and WOW! That sounds freaking fantastic." "the program is really sweet." "I've been a very happy user after moving from [a competitor]." "Very impressed with your product." "...congratulations on such a wonderful piece of work." Try Pure Music FREE for 15 Days! System requirements: Mac OS X 10.5.8 or later (including OS X 10.12 / Sierra); G4, G5 or Intel CPU. Minimum 1 GB installed RAM, 2 GB for Memory Play. 8 GB or more required for high resolution playback (88.2 kHz or higher sample rate) or if running Mavericks or later OS. Demo: without an activation code, Pure Music will function for 15 days with all features enabled. An activation code automatically will be generated and emailed to you within minutes of approving your order. Pure Music 3 is free to users who purchased a Pure Music license after January 2014. For previous purchasers a discounted upgrade is avaiable. Click the Buy button above for more information. Upgrade Pure Music to Channel D Pure Vinyl for recording, editing, analog source switching, vinyl RIAA curve support (and more) for the current price difference. A Pure Vinyl activation code also will work with Pure Music. "[For $129], Pure Music is a bargain." "When playing 16/44 sources, Pure Music sounds as good to me as the best CD transport anyone can dig up - as long as I'm using a high-quality jitter-immune D/A converter. But I can play my 88.2 kHz, 96 kHz and 192 kHz/24 bit masters and then Pure Music beats any CD source. 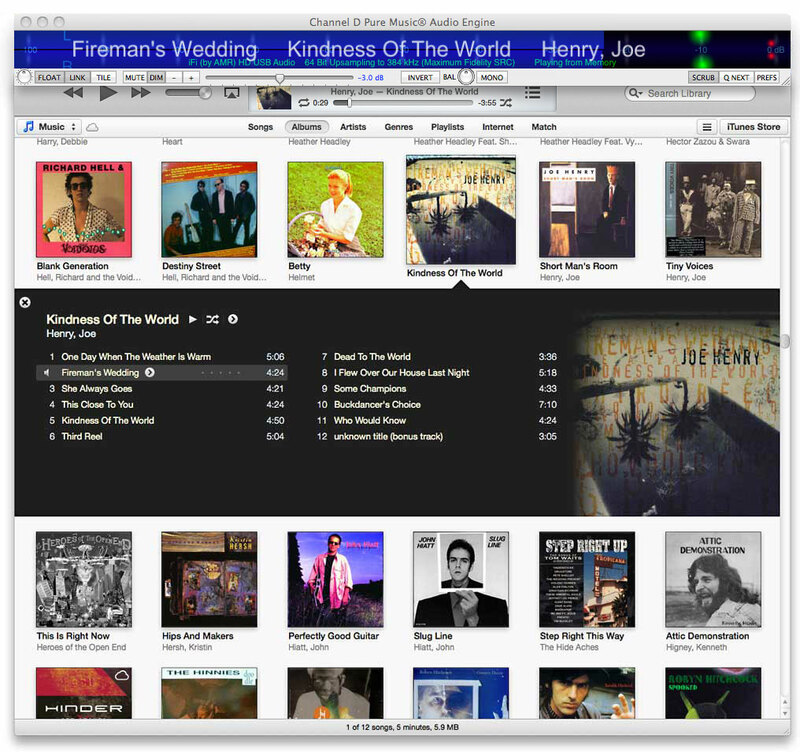 I love being able to play a collection of my masters using the friendly Itunes interface, but with Pure Music bypassing any sound processing that iTunes performs. Throw in a calibrated, dithered volume control marked in decibels, and I'm in heaven. Mechanically, the Mac Mini is quieter than some CD players!" (c) Only one copy of the software is running at any time, per purchased license. Note: The NetSend feature does not require Pure Music to be installed or running on the receiving computer. See the Pure Music User's Guide for more information. 2. United States Patent #8,738,163 B2. 3. Streamthrough may not be suitable for all computer / DAC combinations. Please download and try our free Demo to determine the performance on your own system. 4. Real-Time upsampling doesn't require wasting time or disk space for creating duplicate versions of audio files, and allows immediately making A/B comparisons between native and upsampled playback. Which player sounds better? A published assessment of "playback and sound quality" can only be subjective. If sound quality, performance, and usability may be determined easily by auditioning a downloadable demo, why rely on someone else's opinion? A published review can provide valuable guidance. But when the final decision on purchasing the product can be made in the comfort of one's listening chair, without first making a financial commitment: that's the beauty of software! -- Note: our products may only be used for the reproduction of materials that the user is legally permitted to reproduce. Pure Music is a registered trademark of Channel D. Macintosh, iTunes, iPod and the Mac logo are trademarks of Apple Computer, Inc., registered in the U.S. and other countries.